A loudspeaker that is nice and... well, loud, is a nice asset for your mobile. Whether it's hearing the other person on the speakerphone or your phone ringing from the other room, or even playing music on your get-together's, a loud speaker is definitely something that's nice to have. And while the quality of the loudspeaker sound is difficult to measure and is for the most part a subjective matter, we can effectively measure how loud it is. 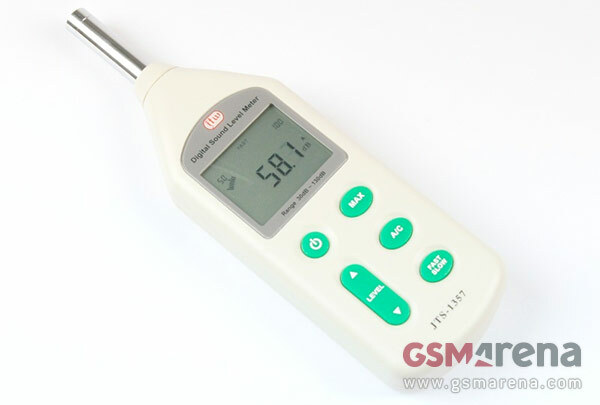 For this, we use a digital noise/loudness meter which measures the peak loudness of the phones and tablets we review, in decibels (dB). 1) A phone ringing. For the first part of the test we use a ringtone which resembles the ringing of an old rotary phone, because it seems that most phones do well when we use it. 2) Pink noise. Next we try a sample of pink noise. Our readings with it are pretty indicative on how well the handset loudspeaker can play most music. 3) Human voice, male. This is an important test, since if you tend the use the loudspeaker for speakerphone purposes, loudness is really important, regardless of whether you are in the conference room or in your car. Once we have the results in db for all three sound samples, we sum them up and use a in-house developed formula to produce a qualitative description of the loudness levels: Below Average, Average, Good, Very Good and Excellent. As many of our results are separated by a difference of only a few decibels, it is important to keep in mind that the decibel is a logarithmic unit, which means that a reading of +3dB represents roughly two times the power. We'd like to reiterate again that this test is not about the quality of the sound produced by the loudspeaker. A mild, relatively deep-sounding loudspeaker that soothes the ear won't do well in this test. Instead, what we are after is pure peak loudness - it's our hunt for the loudest phone, ever.